It's official. The "bromance" has now become a Hollywood genre. And I Love You, Man is the poster movie for this new cinematic chimera. What is a bromance? If one watches this first feature movie by TV director John Hamburg, the bromance is essentially a dating movie where the female object of desire is played by another straight man, rather than a woman. Other than that, it follows the usual dating comedy format: man discovers himself lonely, decides to go into the wild and crazy dating (bro-meeting) scene, is about to give up when he stumbles across the woman (or in this case, bro) of his dreams: who turns out to be his temperamental opposite and and must be convinced of the main character's sincere intentions (and true love). It's perfect casting then that the bro-hunting romantic in this movie is played by Paul Rudd, who seems to be making a career of this role as the feminized straight man. 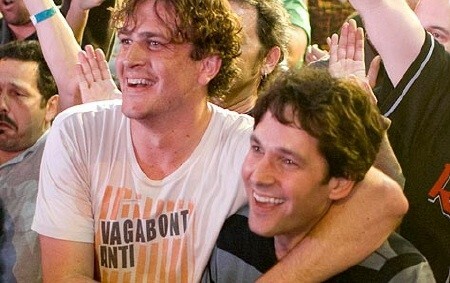 Meanwhile, Jason Segel plays Rudd's real-man opposite, and object of male-bonding desire. I really do think Rudd has a potentially great comedic career in the making, but he just hasn't been consistent: witness the recent Role Models, in which he delivers lines with half-hearted irony. Here, he's much more the Rudd we enjoy, and actually carries the film well and with the goofy likability that he originally pulled off in his first big film, Clueless. The movie opens with Rudd's character, Peter Klaven, proposing to his fiance, Zoeey. Zooey immediately notifies her girl posse of the good news, but Peter, it seems has no male friends to bond with: he's always been a lady's man. And so, with Zooey's blessing, Peter goes out on the hunt to find his best man, who turns out to be chick-magnet and roustabout Sydney Fife. The rest of the plot follows predictably, but with great good humor and the kind of comedic banter that Rudd and company perfected in 40 Year Old Virgin. This is Rudd at the top of his charming, self-effacing game, and Fife's sloppy, semi-employed, Rush-loving doppelganger provides just the right foil for him to bounce off of. There's also a few lovely sidesteps and misunderstandings on the dating scene, guided with workmanlike matter-of-factness by "Saturday Night Live"'s Andy Samberg, who plays Peter's gay (and apparently better adjusted) brother. There is one major disappointment in the ending - which in the usual dating genre requires that the characters learn from each other by working into their personalities the characteristics of their opposite. In Peter's case, that would mean becoming a bit more ballsy, like Fife, while Fife learns to be more sensitive. Neither character has that realization, so the ending lacks the character arch that would make it more satisfying. However, one suspects that the enjoyment of a movie like this is more in the light-hearted interchanges than in satisfying the formula. This is light-hearted pre-summer fluff, all right. But it's good natured and the characters are entertaining and likable. There's a running gag with the way Peter signs off his phone conversations that at first seems like accidental improv and eventually finds its way into becoming an important comedic element in the plot. This is the same technique that 40-Year-Old Virgin pioneered, and it seems now that that movie has spawned quite a few stylistic spin offs. This movie isn't quite as inspired as its predecessor, but for a team of newcomers led by a leading man with something of a hit-and-miss record, it does pretty well.